In this week’s Really Like This book podcast scripts catch-up, I’m in the English Renaissance, pricking across the plain with the Red-Crosse Knight, in Edmund Spenser’s The Faerie Queene. This is the biggest and most elaborate courtly flattery ever written, and it’s not even complete. 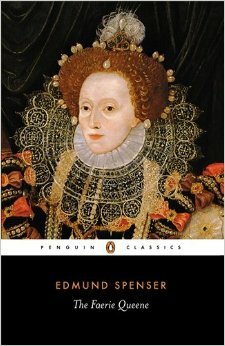 Edmund Spenser was a subject of Queen Elizabeth, the first of that name, and she was a very experienced, very wily old lady of 66 when he wrote the poem to gain her favour. No doubt she was flattered and mightily amused when he personified her as Gloriana, Belphoebe, the Fairie Queene and the Queen of Love in an epic on the moral virtues. It was planned as a poem in 12 books, with each book consisting of 12 cantos, and each canto consisting of 12 stanzas, which were verses of 9 lines each. Spenser only managed to write the first six books, which means he completed nearly 8000 lines of verse. And that was only half of what he had planned. Some fragments of later cantos exist, but the poem effectively halts at the end of book 6. The Faerie Queene is the western world’s longest poem from this period, an action epic, and a Renaissance version of the chivalric romance. Spenser wrote a long letter to Sir Walter Raleigh explaining what he meant with the poem, which is one of the easier ways to get to grips with it before reading. The first thing to notice is that it’s an allegory: a work where characters are not rounded personalities as we would expect them to be in novels, but flat, and unchanging. They represent qualities, symbols, abstract concepts. This makes the multitude of characters very easy to remember: they don’t change, and they are simple black and white personifications. 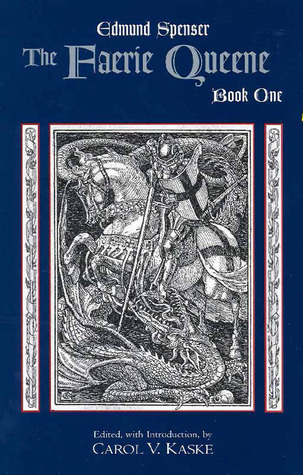 The aim of the Faerie Queene is to show how a gentleman ought to behave, through a series of adventures where knights battle with monsters, and are frequently rescued by King Arthur. Whoa. What is King Arthur doing in a Renaissance poem? Arthur was from the middle ages, the Dark Ages even, a character who emerged after the Saxon invasions and was established long before the Normans, 400 to 600 years earlier than Edmund Spenser. Arthur belongs to a literary tradition that began with relatively primitive poems about military muscle and ended with delicate philosophical discussions about love in a fantasy boudoir. He doesn’t fit in the Renaissance world of Sir Philip Sidney and the Earl of Essex. However, Arthur is also an allegorical figure. In Spenser’s day he was still thought of as the perfect knight, and was, obviously, very well known. As a figure in a poem dealing with the twelve moral virtues, he would have no ulterior motives, or be anything other than a perfect kingly paragon of virtue. 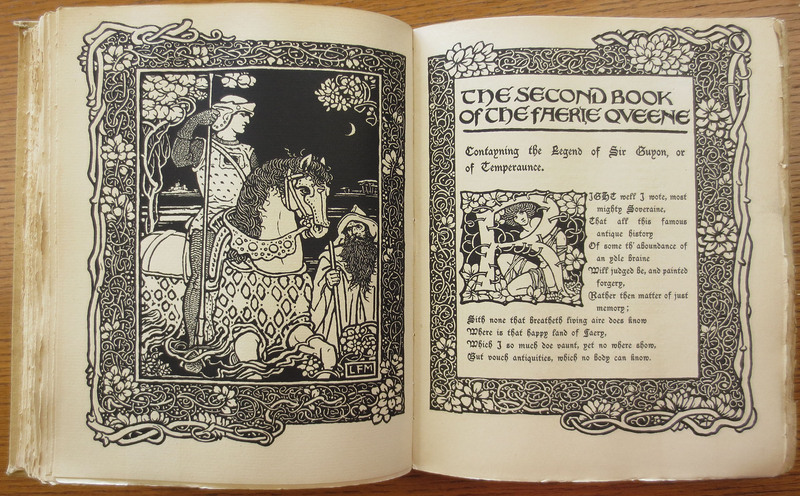 The plot of the poem is, broadly, that Prince Arthur is on a quest to find his beloved Faerie Queene, an allegorical portrait of Queen Elizabeth, and is continually interrupted by entering the adventures of other characters. Spenser separates the figure of Arthur completely from the ‘matter of Britain’ that we usually associate him with (by which I mean Lancelot, Guinevere, the Holy Grail) by transplanting him into a totally different fantasy landscape. 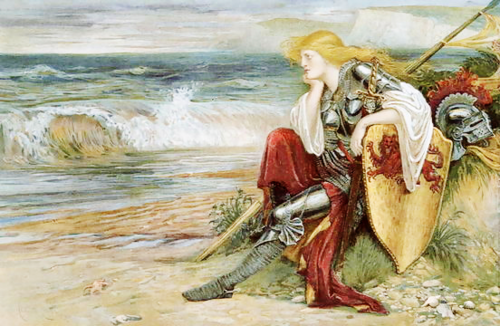 Queen Guinevere doesn’t exist in this new incarnation of Arthur’s story: he’s a single knight in pursuit of a new lady as the object of his courtly love, the Faerie Queene herself. In the six different books of the poem, Arthur functions as the all-conquering knight to rescue those in need. Each book is about one of the moral virtues. Book 1 is about Holinesse, the second is about Temperance, the third is about Chastity, with a female knight as the hero, the immortal Britomart. The fourth book is about friendship, the fifth is about justice, and the sixth is about courtesy. Each book tells the adventures of a different knight, and that knight’s lady, and the monsters they encounter, the temptations they struggle with, and how they embody their book’s particular virtue. 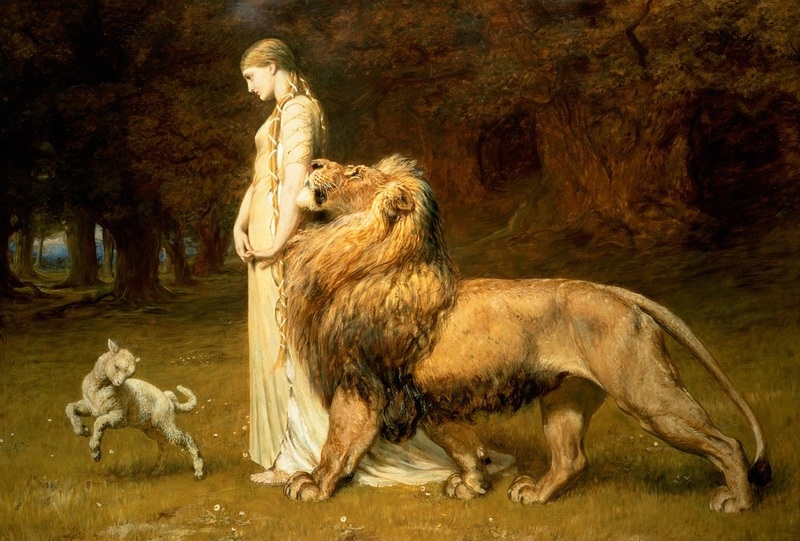 The story is very stylized, and utterly unrealistic, which can be explained by thinking about how story, as tales told in poetry, was evolving in English literature. By the sixteenth century, when the Faerie Queene was written, readers of romances and poetry were a bit bothered about the apparent disinterest that much earlier writers, for instance Chaucer, had in noticing the difference between fact and fiction. Renaissance readers felt that romance needed to be quite clearly romance, and narratives of exploration and discovery needed to be believable and true, and usable as guidebooks. The form of the narrative wasn’t important: a poem about the exploration of the New World would have been quite acceptable as an emigrants’ guide. What mattered was the presentation of facts as facts, and fantasy as fantasy. So the characters in the Faerie Queene do not show anything like real-life behaviour. They are also unfazed at encountering cave-dwelling monsters, talking trees, processions of foul fiends in the wilderness, or dragons. This is all standard, and this is why the Faerie Queene is such fun to read, if you like that sort of thing. Book 1 is a self-contained epic on its own, and is thus the one book most widely studied in university classes. The story is also very attractive: the Red-Crosse Knight (who represents Holinesse) begged the Faerie Queene at her court to be allowed to undertake his first quest. He was weary of hanging around the court as a junior untried squire: he wanted action. So, graciously, the Faerie Queene, or Gloriana, agreed that the next quest to be announced at court would be his. The next day, a maiden of great purity arrived, asking for help from a brave knight to rescue the kingdom of her father, the Emperor, which was being terrorized by a dragon. Gloriana announced that she had just the knight for the job, a most experienced and doughty warrior; may I introduce the Red-Crosse Knight? You will have spotted that Gloriana was not telling the maiden what the knight had told her, and I’m not quite sure why: I haven’t looked deep enough into the critical literature to see what the experts think of this apparent continuity flaw, or deliberate falsehood by the queen of truth and beauty. Anyhow, the maiden, whose name was Una, gladly accepted the knight’s service, and off they went. Almost immediately (because this story does not hang around, each canto has quite a bit of action) Una and the Red-Crosse Knight are misled and separated by a wizard called Archimago, disguised as a holy friar, and a strangely smiling lady called Duessa. These two are better known to Spenser’s original readers as Satan and Duplicity, and they force the two holy heroes to endure many trials and terrors, all connected with belief, and with chivalry, and the terrible lure of Catholicism, before being rescued by Prince Arthur. That ends Book 1, and we enter Book 2 with gusto, appetite whetted for more fantastical adventures. To understand the odd religious bias again Catholicism, we need to remember the persecution dealt out to Catholics during the reign of Elizabeth, and the persecution dealt out to Protestants during the reign of her elder sister, Mary I, or Bloody Mary, a generation earlier: practical effects of the history of the Protestant reformation in England. Spenser was aiming to please his own particular Protestant queen, so he packed this first book of the poem with spectacularly simplistic, negative messages about Catholicism. These too are part of the poem’s fascination, in decoding and untangling what Spenser’s audience would have understood immediately. We do not need to read the Faerie Queene in translation: it is remarkably accessible in Elizabethan English. If you can understand Shakespeare you’ll be able to understand this. But I suggest that you try it as an audio book or CD, if you’re nervous about antiquated spellings putting you off your stroke. English has changed much less in sound from Elizabethan times than it has in its spelling, so focus on what the words sound like. 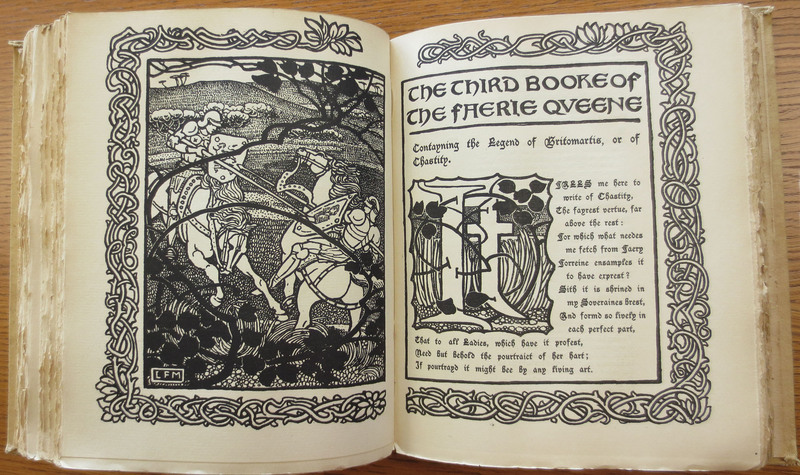 On the other hand, if you can get hold of one of the lovely nineteenth- or early twentieth-century facsimile editions of the Faerie Queene, you can enjoy the classic layout of the stanzas of each canto in double columns, and the helpful rhymes at the start of each canto that summarise the action. For so long I have wanted to read this; (in whole, not just parts)…thanks for a lovely overview and the extra gems of historical relevance. Interesting to note how the addition of Arthur was an anachronistic borrowing of a symbol that would instantly bear a positive meaning to the contemporary audience, and would carry the knightly tradition forward to the current monarch. (Guinevere not being needed in this case…) ! •Thrilled• that you took on the great Edmund and I can’t wait to hear about the other four neglected Elizabethans. My young daughter and I spent three years reading The Faerie Queene (and The Mutabilitie Cantos) and were completely enthralled. It’s a great window into the time and the beauty of knightly chivalry for the young imho — and not hard at all with the running glossary. Btw Mr. Modernism, T.S. Eliot, had a special fondness for Spenser, which I always found counterintuitive and interesting. I once read that Queen Elizabeth never read it, which if true is a terrible shame — though she wouldn’t have liked the veiled criticism of her Ireland policy in Mutabilitie. Also thought Spenser’s deliberate archaism in language was entertaining if not thrilling, though I wonder if that’s what puts today’s readers off of his work. Thank you •so• much for all of your work and your amazing finds, especially for this five-part series! Thank you! But the other three in the series won’t be Renaissance: I began in the Anglo-Saxon mud, and next I do Milton, then Pope and then (I think) Tennyson. Hope you enjoy them too!